To the closely spaced houses and straggling few vehicles along some two-lane roads in the outskirts of Houston, the sun had just set on what seemed like any other Saturday evening in September. But it wasn’t. It was the first Saturday in a long time that this place, and Texas as a whole, had seen this kind of action. The left turn into the facility was so inconspicuous that you’d almost miss it if you were in the middle of a conversation, but after a hard braking and a quick smack of the turn signal, you’d realize that it was no secret to the people who wanted to be there. The outer rim of a banked turn, which looked like nothing more than a grassy hill from the road, spelled it out in bold, red letters: Houston Motorsports Park. There often aren’t vehicles on the other side of that outer rim, a concrete wall meant to keep race cars within their rightful confines. Most cars that come to the facility don’t come for the three-eighths-mile oval. They come instead for the drag strip’s “Friday Night Street Fights” nearly every week of the year, where visitors can race all night for a couple of $10 bills. But the oval, an odd mix of dark-colored asphalt straightaways and far lighter concrete corners, remains dormant as far as competition goes. It has since 2015. The track had what it calls a “very good sponsorship deal” from Fiesta Mart that ended, meaning that its last year of running a monthly oval-track schedule was 2014. It ran six races in 2015, then closed the following year. It took a state full of racers with nowhere to go to once again light up that oval nearly two years later. As local asphalt short tracks—the club sports of racing, if you would—continued to close across the state, hobby and lower-level racers continued to migrate to the decreasing few that were still open. Tracks closed for all sorts of reasons, from money to “liability concerns” to sheer lack of interest or participation. Part of the reason so many short tracks closed over the years was that starting grids weren’t nearly the same in Texas as in other states rich with this genre of racing, and crowds weren’t, either. Two of the highest classes in short-track racing, asphalt Pro Late Models and Super Late Models, have touring series all across the southeastern U.S. and the East Coast. Among the Late Models in several major U.S. touring series—the CARS Tour, Southern Super Series, ARCA/CRA Super Series and JEGS/CRA All-Stars Tour—there multiple are race dates in Georgia, Florida, Virginia, Tennessee, North Carolina, South Carolina, Alabama, Florida and Missouri. Those states also have some of the biggest races on the short-track calendar, like Florida’s Snowball Derby. That kind of thing doesn’t happen in Texas, and car counts for those classes are often just in the single digits when they attract dozens elsewhere. The numbers in Texas haven’t been comparable for decades, with race tracks in Austin, San Antonio, Houston and other big cities all opening and eventually closing the gates. Some got paved over, while others are still there, slowly rotting back into the earth. Then, after less than two decades after being built, the last remaining asphalt short track in the state closed. Bulldozers began to sweep it off the small-town Kyle, Texas map not long after. Both the hobbyist local racers and aspiring oval drivers had to decide whether move to another state, travel at least 13 hours just to race, swap their asphalt cars for dirt or give up on the sport altogether. Instead, the racers got creative. They begged to revive the track in Houston. Houston Motorsports Park gave them two dates for the 2017 season, one in early July and the other, called Speedfest, that just occurred in late September. Almost exactly a month after the track was underwater from Hurricane Harvey, it was back open again for its second and final oval race of the season. Signs around the track asked visitors to “please excuse” any mess from the storm. The September race date, for now, is the last for short-track asphalt racers in Texas—unless they can carve out another next year. The air had just enough of an autumn feel to it that a breeze would give you goosebumps, but you’d get far more from seeing the cars on track. The grassy parking lot was rows deep with cars, as were the bathroom and concession lines with people. It was a successful turnout for a type of racing that hasn’t found much success in the state, ever. The track looked like it hadn’t been used for competition in years—not in a run-down sort of way, but in how dated things were. The Fiesta Mart logos were still up. The outside walls still had the old NASCAR logos on them, replaced in December of 2016 after the sport brought in a new title sponsor for its top series. What was once a brightly colored Busch Beer logo on the scoreboard had faded to the point that you had to squint to read it from far away, but it wasn’t a big deal. The scoreboard itself wasn’t on. That meant there was no lap counter, no position tracking or anything like that for the people there. You had to keep count of the laps in your head, and if you lost focus for a bit, you probably wouldn’t know who was in the lead—cars get lapped quickly when the tracks are this short. But that didn’t matter. It was peaceful, ignorant bliss enveloped by the sound of often beat-up cars in the air. A crescent moon hung just over the red-and-blue grandstands on the track’s tiny front stretch, while a large American flag did the same on the other side. Feature races started just after 8 p.m., race cars rolling behind an orange Chevrolet Camaro with white racing stripes and its emergency lights on to signal the pace laps. Drivers waited for their turn in the pits, a parking lot where haulers—both the large, fancy ones and those barely big enough to transport a race car in—lined the dimly lit area as small crews worked on the vehicles. Drivers of several of the Pro Late Model entries, the highest class there, said they get most of their racing in by traveling to tracks several states over: Mobile International Speedway in Alabama, Five Flags Speedway in Pensacola, Florida, South Alabama Speedway and the like. Two drivers, both Texas residents, talked about big-money Late Model events helping lure them on the long drive to those other states—races like the annual Snowball Derby, and the Rattler 250, where winners have to take photos with a rattlesnake. One driver, Michael Villarreal, looked to be in his early 20s. 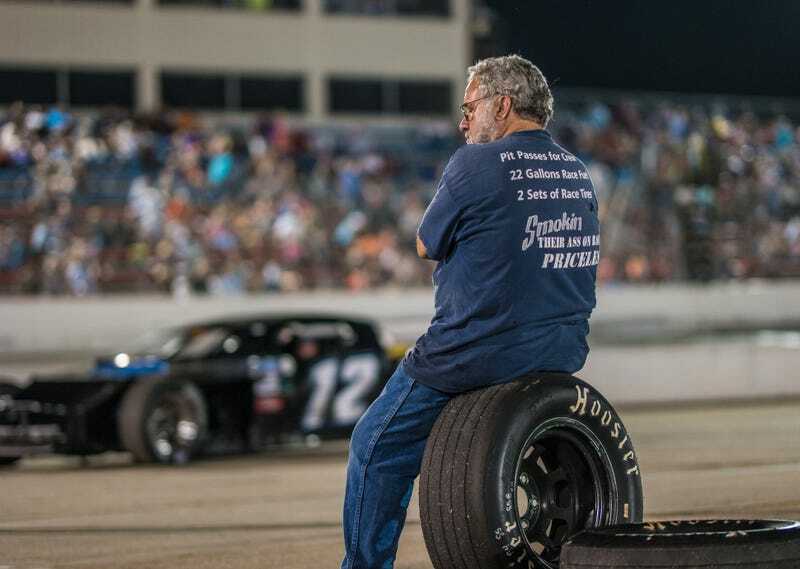 His father walked up, seeing someone taking professional photos of the race car they’d just bought from known Late Model racer and two-time Snowball Derby winner Augie Grill, wondering where he’d be able to find them. Villarreal said he knew people who had switched to dirt racing after the last asphalt track closed. He considered doing it himself, but decided the traveling would suffice for now. He drove a much shorter route to this race, about four hours from Corpus Christi. He said he brought Grill’s former car to “work the bugs out” before taking it to big-hitter Late Model races in other states, like Snowball Derby weekend, at the end of the year. Another driver, Corey Roper, was helping someone he introduced as a “friend,” without a team title, work on his No. 04 car a few hours before the Late Model feature. He talked about traveling to other states from his Texas home like Villarreal and his dad did, making sure to put big races like the Rattler on his schedule. When asked if he truly wanted to win and hold a snake at the end of the Rattler, Roper said “Hell yeah” with a half smile on his face. He won the Late Model race in Houston with a late pass for the lead later that night. In other states, short-track racing is a show sprinkled with big-money drivers who have generations of family in the sport. The biggest names in NASCAR live on the East Coast, after all, and it’s easy to see from any Snowball Derby entry list that the southeastern part of the U.S. is where they run their short tracks. In Texas, short-track racing is just trying to survive. And for now, Houston is its ray of hope. As the night went on, spectators watched from the main grandstands, outside of the track walls and under the drag-strip stands that faced the other direction along the backstretch. Motorcycles and golf carts were parked all around, as people found their own seats and watched from every angle available. People could go almost anywhere they wanted other than on the race track itself, with track security being as laid back as many of the spectators. That’s part of the charm of local racing—you don’t need an ID card to scan in and out of different areas of the track like in F1, and you’re not barred from entering the pit or garage area without a special VIP-type pass like in NASCAR. Two officials spent most of the race at the top of the second turn, within the track walls, helping direct cars on and off of the track—both during and between races. With the high banking and wide slab of concrete and asphalt, cars rarely made it to the outer wall where they stood. The infield was almost all grass, with a small road connecting from one set of turns to the other. The majority of those down there were working on a car or employees of the track. Victory circle was a tiny, elevated platform just big enough for a car with a banner behind it, and winners had a few minutes to pose for photos before that Camaro led next class of cars rolled onto the track. There were no pit stops unless something went wrong on a car, perhaps because there was barely any room to conduct them. When things did go wrong, team members on pit road stood from their makeshift seats on piles of tires or golf carts to try to remedy the issue. After all, they still don’t know when the next time they’ll make laps there will be. The rush to get back out on the track was so real, and so paramount, that a truck even entered pit road from the wrong side after a wreck in the first turn. Sixteen modifieds roared past early on, sending a continuous shudder through the stands and the PA speakers lining the track. A slight woman stood under the drag-strip grandstands, her light-gray hair pulled back into a low ponytail and thin glasses on her face, clinging to the chain-link fence as the large group of modifieds made pace laps. She was the same person who greeted cars at the track gates, taking entrance fees and bearing the Texas Asphalt Racing Series logo on her T-shirt—a series which, according to its website, “was created by racers to bring asphalt racing back to the great state of Texas.” They succeeded, if only for this one night. She stood there, teal pack of cigarettes in hand, looking as if the races were where she truly felt at home. There was a sort of peace about her. Once the 75-lap modified race got the green flag, her hands moved from the fence to her ears, pressing on them to mitigate the sound. It didn’t take them long to calmly migrate back, and it didn’t take the modifieds long to wreck the field into the single digits. The modifieds were only one of nine classes at the track, nearly all of which sent a rumble down your throat as they thundered by. It was easy to lose count of the laps, with no scoreboard and the type of frantic racing you’d expect from people who haven’t been able to compete on asphalt in their home state—groups of cars battling for the win, crossover moves galore, drivers spinning the leader out, and at least one blatant revenge hit. It was true, sometimes mindless, bliss. That night at Houston Motorsports Park had all of the sights, smells, attitudes and tempers that a local race should, whether that be in Texas or in states where it truly is a normal thing. It felt like something that never should have had to be begged back into existence, yet that’s the only reason this night came to be. It was a reminder that we, as a state, let something so special slip into near extinction. Whether or not another race like that happens again, the asphalt short-track scene in Texas is better off because it did. And whether or not a tiny bit of hope comes back to the short-track scene in the state, we can at least all know how much worse off we are without it. Around midnight, after the crowd began to thin out.